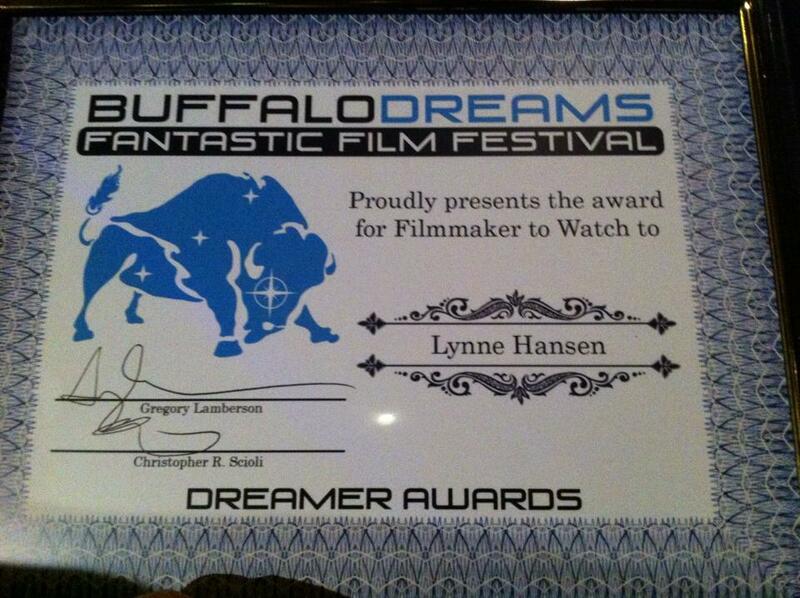 On Sunday, November 9th, Lynne Hansen was presented with the 2014 Filmmaker to Watch Award at the Buffalo Dreams Fantastic Film Festival. 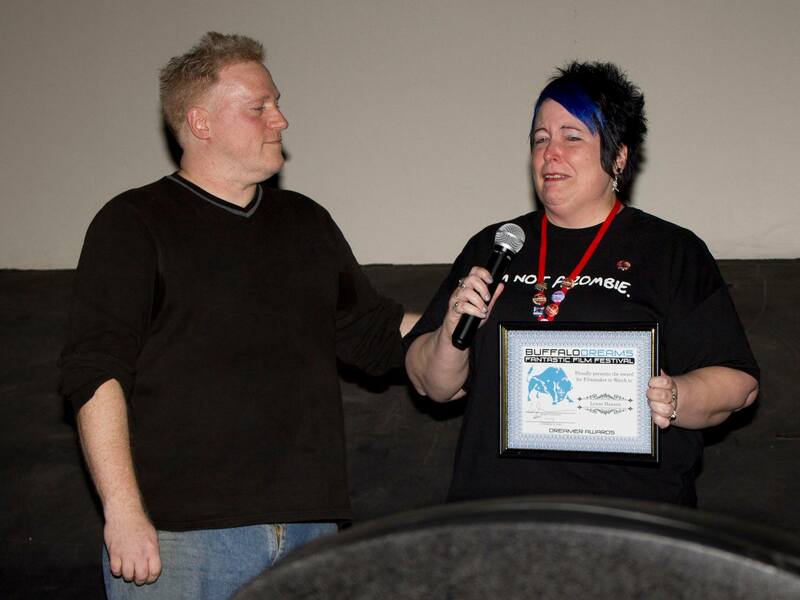 Dark Scream Film Festival programmer Sylv Jenkins interviewed He’s Not Looking So Great’s producer and director Gregory G. Kurczynski and screenwriter Lynne Hansen for All About Film in preparation for the film’s UK premiere at the Dark Scream Film Festival April 9-11, 2015 in Portsmouth. We are pleased to announce that CHOMP has been selected to play at the Florida Horror Film Festival. The festival takes place Saturday, November 1st and Sunday, November 2nd. Director Lynne Hansen and Susan O’Gara (Millie) will be in attendance. Kyle Porter threw himself headlong into the role of Kyle Frost, bringing with him fantastic instincts and natural talent that brought the character to life in ways that most directors can only dream of. I know you’ll enjoy this opportunity to get to know him a little better. Q: Why on earth did you agree to work with a new director on her very first short film? Are you insane? A: I agreed to perform in Chomp based on the same criteria I use for all my prior roles: the script. Lynne’s script was original with great character arcs. It was refreshing to read a short with such a strong story and real characters. The real question should be, how could I say no? Q: What was the hardest thing you had to do while making CHOMP? A: “What’s the hardest thing I had to do” is a loaded question. While I thoroughly enjoyed every moment, I was actually chained to a cinder block in an itchy zombie costume for about ten hours on my birthday weekend. I had an inch of thick zombie makeup constantly sweating into my eyes because we couldn’t run the air conditioning. CHOMP was a long, hard and fulfilling day at work, and I love my job. Kyle being released from his sweaty costume and heavy chain for the very last time. Q: Lots of things went right while making CHOMP. Tell me about something that went right that surprised you. A: We had one take to get an important shot and limited time to finish filming. With only one chance, we not only got our shot but we were also able to keep the scene going through the next shot, saving us at least an hour of extra work. The collaborative effort of the amazing director of photography, Daryn Murphy, and the director, Lynne Hansen, and myself came out to be better than the original plan. That should be the concept behind all films–art through collaboration. Kyle in the middle of his one-take-wonder scene. The director swears it cut at least 2 hours out of the shooting day. He’s far too modest. Q: Why do you think people will like CHOMP? A: I think people are going to like how funny and original it is. It stays true to its genre while stepping outside of itself. A: I just wrapped a web series called Everyday Spooky which I acted in and helped write. It’s a sitcom set in a supernatural town. Check out the Facebook page Everyday Spooky for more details. Kyle Porter is making his glorious return to film in the soon-to-be-classic, “Chomp”. He is a natural jack of all acting trades, from portraying characters on stage such as Tom in “Night of the Living Dead”, Benjamin Braddock in “The Graduate”, and Woody/The Hustler in “Six Degrees of Separation”, to his work on films like “Chomp” and various shorts and commercials. He will be featured as Topher in the upcoming web series, “Everyday Spooky”, to which he is proud to have contributed as both an actor and a writer. He is grateful for the opportunity to pour his blood, sweat, and brains into this character and excited to see it come to life. Favorite zombie movie: 28 Days Later. The Director Says: Kyle brought a wonderful combination of vulnerability and wise-assed humor to the role of Kyle (named before he was cast!) He was game for anything, including wallering all over a grungy garage floor with a heavy chain around his neck for hours at a time. (He called the scar on his neck a “chain hickey.”) Kyle’s creativity and amazing instincts as an actor wowed me time and again. Susan O’Gara came on board Team Chomp never having seen a zombie movie, and tackled the role with the most amazing verve and enthusiasm you could imagine. Enjoy this interview with her. A: Yes, I guess, I must be a bit insane–so the part of Millie was a perfect fit-type casting. Seriously though, Lynne immediately presented as a dedicated, no nonsense, director. She was serious about covering all aspects of directing with the highest standards as well as caring personally for all the actors’ and crew’s needs. Also, her script was fun and beautifully written, if you can say “beautifully” about a zombie script. Another reason was the serendipity that a mutual friend’s garage was the location! A: The hardest thing was watching our wonderful director get walloped with so many obstacles which would have derailed this project for other directors. Q: What did you like most about being involved in CHOMP? A: Playing such a fabulously insane character while supported by such an excellent director and crew and fellow actors. Q: What’s one of the funniest thing that happened while making CHOMP? A: Eating brains off camera was fun and funny-yum yum yummy and prepared by our fabulous location manager & provider Sally Bosco. Susan eating brains with Sally. A: Because it is a well written humorous look at the zombie apocalypse and because the “bad guy” gets his/her comeuppance. A: I’m working on a Christian short for Storyhub near Cocoa on the east coast of FL and on a Christian feature film Grace of the Father in the Mt. Dora area (will be script supervisor as well as a very small role in this). Also, I will be one of the Mrs. Clauses at Busch Gardens in their Christmas Town during November & December. Susan O’Gara has performed in musicals, dramas and comedies in professional and community theatre in Ireland and Florida. Susan had the lead in the film Deserted, and the short “Chomp” and support roles in the shorts “The Wallet” and “How Not to Urn a Living.” She received her B.A. in Drama and M.S. in Speech Pathology from Florida State University. Favorite lead roles in theatre include Hello Dolly, Foxfire, The Secret Affairs of Mildred Wilde, Lettice and Lovage, The Rainmaker, and Morning’s at Seven. As well as acting, singing and dancing, Susan has directed plays for her church and worked as an assistant and script supervisor for Lazarus Filmworks. She received numerous acting awards in the Irish Drama Festival Circuit and Tampa Bay Community Theatre Awards. Susan is interested in film, radio and theatre which enrich the viewer bringing, not only joy and laughter, adventure and drama, but wisdom, compassion, forgiveness, and enlightenment to the soul. Favorite zombie movie: Return of the Living Dead. The Director Says: Susan is an unparallelled talent. She took on this role never having even seen a zombie movie, and that’s a huge part of why she did so well. She saw Millie as a person, not a horror movie caricature of a crazy little old lady, and I am so very thankful for that. Susan was also our biggest cheerleader on the set, helping to keep everyone positive and upbeat. But that’s just who she is. When she scraped her arm on a rusty nail mid-shoot, her biggest worry was not tetanus, but whether or not people would notice the Band-aid on her arm in some shots. Now that’s a trooper! Joel D. Wynkoop was incredibly kind and giving during the CHOMP shoot–and in this interview, so much so that I had to cut it in half. I’ll share the rest soon. So here it is, part 1 of my interview with Joel D. Wynkoop, who played Dr. Jon Croft in CHOMP. Joel D. Wynkoop during the Dr. Jon Croft Pit Bulls and Zombies Hour. A: I met Lynne many years ago and have been a friend and a fan of hers ever since. When she asked me to be a part of CHOMP I was honored. She has so much enthusiasm it is hard to say no. I gave her my all, and then some–coming back for re-shoots, ADR, whatever–to help see her dream become a reality. And I would do it all over again too. Lynne is a lot of fun to work for, she knows her vision and will see it through to the very end. Her script was also fun and I like doing something that is lighthearted but at the same time be a little scary so it was GREAT to be able to do CHOMP. Getting up in the morning to be on set on time. That’s it. It was a fun shoot. I learned my lines and Lynne even let me improvise a little which I love when a director will just let me run with the role. Working with Kyle Porter was also awesome. He is so talented and I was lucky enough to work with him again on the set of “Everyday Spooky”. The hardest thing I had to do was walk away when it was all over. Here’s hoping I can work again with Lynne in the future. It was a lot of fun. Q: Tell me about something that went right while making CHOMP that surprised you. A: The location was GREAT. Talk Wad Studios was a perfect location for Dr. Jon Croft’s TV show, thanks to owner Alex Wadsworth. I’d actually hosted my internet TV show there for years. On the day, it looked great. I even helped Lynne and Kyle put posters on the wall to help dress the set. It was awesome. Kyle, Alex, Joel, Lynne and Jeff at Talk Wad Studios. Q: Tell me about a time when you didn’t think CHOMP would ever get made, and how the challenge was overcome. A: I think I knew it would always get done. I have been on sets before where I have said “This is never going to be completed,” but I knew Lynne had a vision and she was not going to let it NOT happen. Most of all was the completion date because ADR had to be done or some reshoots or some sound issues or music post stuff but I still knew Lynne was going to pull this off, there was no “Quit” in her vocabulary! It was no challenge for me. I stood by Lynne and told her “These things happen sometimes you just have to keep pressing on and everything will work out.” And they did! A: Working with Kyle. He and I hit it off right away! At one point Kyle and I just went off on our own dialogue and Lynne never stopped us. In fact when we stopped she said, “What are you stopping for that was GREAT! Do it again!” That was the best!!! Kyle and I were having a BLAST and Lynne was enjoying it and I think even our sound guy was cracking up at our performance. The whole thing was a lot of fun for me and I think personally everyone involved! Kyle and Joel hamming it up after filming. A: It’s a fun story. It’s kind of scary in an innocent way. Does that make sense? Well yeah, look at Shaun of the Dead, scary but funny. It will make you laugh. Susan O’ Gara who plays Millie is GREAT in this. She is very funny and plays her role to a “T”, taking it so seriously that it becomes funny. Also is the little star of this Ellah Durliat who also does a great job! There really is something for everyone. You like to be scared? Then this movie is for you. You like to laugh? (And who doesn’t?) You’ll love this movie. Don’t take my word for it. Come see it at The Tampa Pitcher Show this Sunday, October 19th at 12:00 pm. It is going to be a zombie BLAST! Joel D. Wynkoop has been acting…well since he was a little kid, but graduated into Super 8 movies in the 70’s. In the 80’s he teamed up with Tim Ritter to do Twisted Illusions–the movie and the company–followed by Truth or Dare, Lost Faith, Dirty Cop No Donut and over a hundred other films including Herschel Gordon Lewis’s The Uh-Oh Show. He’s also well-known for his TV shows, “Joel D. Wynkoop’s The Other Side” and “The Joel Wynkoop Show” as well as countless TV commercials, infomercials, and stage plays. Joel Wynkoop has definitely paid his dues. He continues to act today wherever the movie takes him. Favorite zombie movie: George Romero’s Dawn of the Dead. 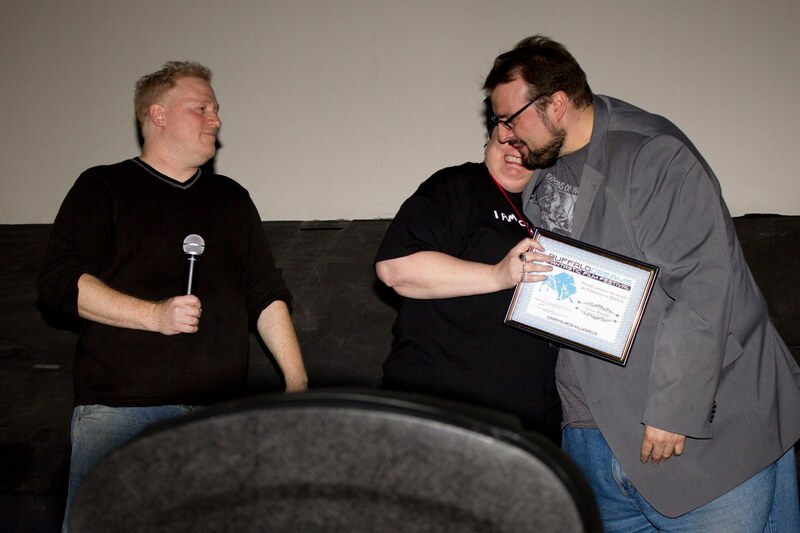 The Director Says: With all the experience Joel has, he went out of his way to make a first-time director feel at ease. Professional, funny and kind, he did everything possible to make “Chomp” a success, including bringing his own bazooka to the set! CHOMP is the product of the hard work of many talented, dedicated folks. In this series, I’d like to introduce you to some of them. Jeff Strand is the four-time Bram Stoker Award-nominated author of such demented novels as Pressure, Dweller, Wolf Hunt, A Bad Day For Voodoo, and a bunch of others. His story “Gave Up The Ghost” was made into a short horror/comedy (mostly comedy) film, directed by Gregory Lamberson, as part of the anthology film Creepers. His novel Pressure is in development as a feature film. His “Associate Producer” credit in CHOMP basically meant that he bought food for the crew, hauled stuff to and from the van, ran the clapboard, took inaccurate notes on the sound recording, and sweated a lot in the really, really hot garage where filming took place. He is also married to the director, which explains a lot. Favorite zombie movie: Shaun of the Dead. The Director Says: There are not enough words in the English language to tell you all the wonderful things Jeff did for me during the making of this movie. He became Craft Services, procuring all the yummy things we ate on set. He became Prop Master, running to Walmart at 2:00 am to get last-minute supplies needed for an 8:00 am call time. He logged miles just hauling stuff in and out of Sally’s garage. Most importantly, during crunch times, he made sure the cats didn’t starve and house didn’t collapse. He rocks. A: As the spouse of the director, my choices in the matter were limited. Also, I am insane. Q: Lots of things went wrong while making CHOMP. Tell me about one of the more memorable ones. A: One of my most prestigious jobs was to pick up the ex-lead actor from the hotel where he’d stayed for a big high school drama festival. He, of course, was a no-show when I got there. For the next twenty minutes, I got to play the role of the Creepy 43-Year-Old Guy Wandering Around A Hotel Lobby Packed With Teenagers, with hotel staff asking “Uh, can we help you, sir?” multiple times. I was mad AND it was uncomfortable, which is a delightful combination. A: Trevor Strong was an obvious choice to create a catchy little jingle for the show-within-a-movie, but the lyrics were already set: “It’s the Dr. Jon Croft, Pit Bulls & Zombies Hour!” All we needed was a tune and a professional recording. We knew he’d deliver…but the jingle is absolutely hilarious. I wouldn’t have expected something that was laugh-out-loud funny when he was just singing the pre-written lyric! Q: Tell me about a time when you didn’t think CHOMP would ever get made. A: I never thought it wouldn’t get made, but we did have two shooting days (in a movie that was only supposed to HAVE two shooting days) where we were suddenly told “[Crucial Actor] is going home.” Too much was invested in the movie by then to give up, but those were two great big “Oh, crap! What do we do?” moments. We stayed calm, shot what we could, and were lucky enough to have a crew who was willing to return on another day to finish it up. Q: What’s one of the funniest things that happened while making CHOMP? A: Kyle Porter was doing a scene where his character is screaming for help through an open window in the garage. He did this for several minutes, at full volume, and the whole time I was thinking, “Jeez, I sure hope none of the neighbors call the police.” He finished the scene and we moved on, and then it occurred to me that somebody can scream “Help! Help! I’m trapped! Somebody help me!” through an open window in a garage for several minutes without anybody bothering to call 911. A: It’s funny, it’s weird, the acting is fantastic, the visuals are great, it’s got a couple of catchy tunes, and though you don’t see it in the actual movie, the handwriting on the clapboards was exquisite. Q: Anything else you’d like to share or talk about? I wrote the screenplay for a short film called GAVE UP THE GHOST which will also be part of the Halloween Horror Picture Show lineup. It was directed by Gregory “SLIME CITY” Lamberson. I don’t know what order the films will be played in, but if people see CHOMP and then leave the theater before GAVE UP THE GHOST screens, my tender feelings will be hurt. 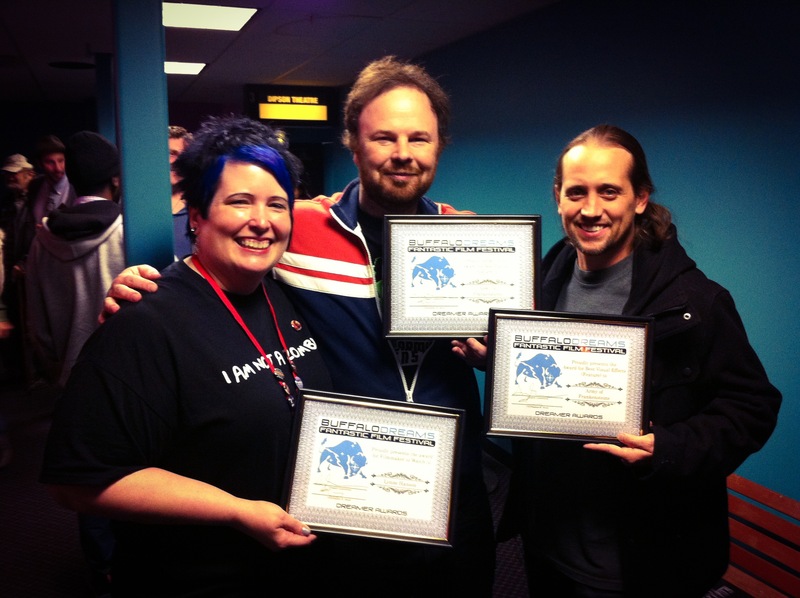 We’re pleased to announce that CHOMP has its first out-of-state screening–at the wonderful Buffalo Dreams Fantastic Film Festival! 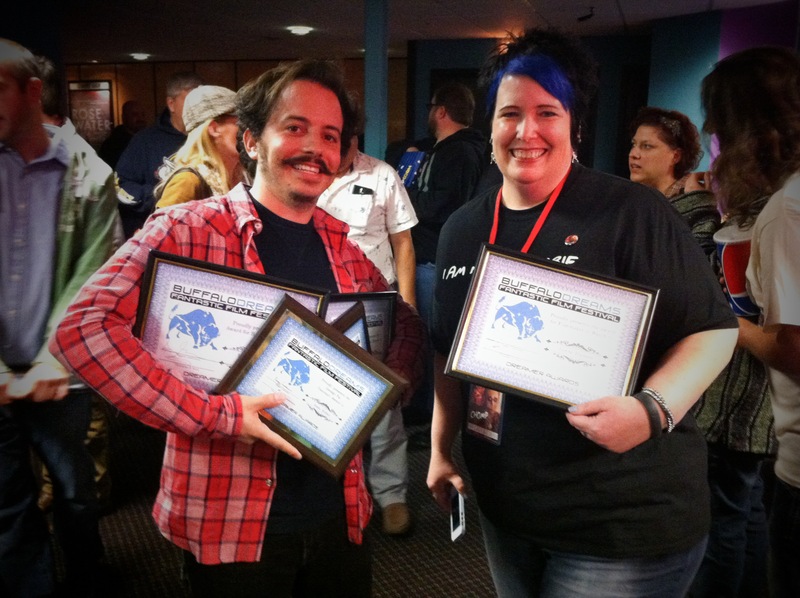 This will be our second year at Buffalo Dreams; last year HE’S NOT LOOKING SO GREAT was a finalist for Best Comedy Short. 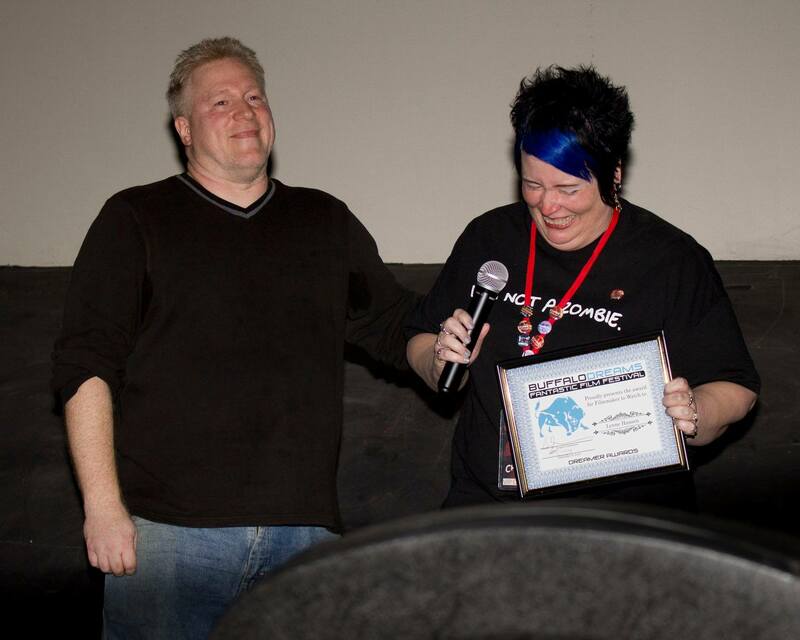 Screenwriter Lynne Hansen and director Gregory G. Kurczynski at the 2013 Buffalo Dreams Fantastic Film Festival last year. HE’S NOT LOOKING SO GREAT is now an official selection of the Dark Scream Film Festival in the UK! The programmers said the little preview screening we had Wednesday night went so well that they had to have us back for the big festival in May. They said everyone cheered at the end and that we were “a breath of fresh air within the horror film genre.” Not too shabby!